GREAT dystopian fiction! I really enjoyed this book! I haven't read too much since having the baby, but I read this book in only two days. I was all about it! There is plenty of action, suspense and romance. The characters are well developed and my favorite character is Four. I just LOVE him! I even love why he is named Four! But I'm not so hot about his real name... I just think Arrested Development... 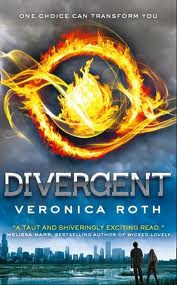 Anyway, for those of you who want your Hunger Games or Matched fix, this is the book! Let me know what you think! I really want to read this one. I've been hearing nothing but great things about it.